Tablet PCs feature a touchscreen. You can use your finger as an input device, but your finger is short and stubby and, please, you need a manicure. A better option is to use a digitizer pen. The stylus is a pointing device, like the mouse. For the most part, it works just like a mouse: Tap the screen to click, double-tap, right-tap, and so on. Okay: There’s no such thing as a right-tap. Before using it, however, take a look at the pen. Check out the important parts. A typical tablet PC stylus. The function of the pen’s buttons varies. Generally speaking, one of the input buttons is the right-click button. On a two-button stylus, the second button is the Erase button. The digital pens that are compatible with the Microsoft Surface tablet place the right-click button above and the erase button below. Just because your laptop features a touchscreen doesn’t imply that a digital pen works as an input device. To confirm that your tablet PC can use a digital pen, open the Control Panel. On the Hardware and Sound screen, look under the Pen and Touch category. If you see an item titled Change Tablet Pen Settings, your laptop can use a digital pen. Some digital pens use batteries. If so, rush out to the Battery Store right now to buy a spare battery or two. 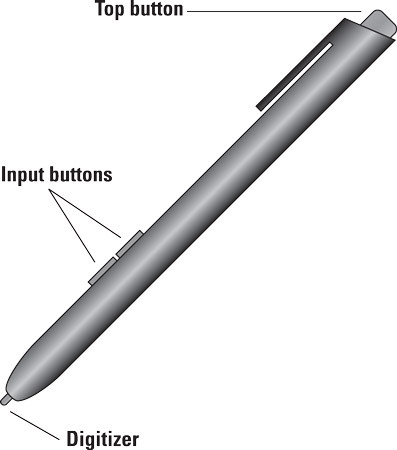 Some digital pens feature one button, not two. If so, the solo button is the right-click button. You can still use the stylus on the screen of a convertible tablet PC when it’s in a standard laptop configuration. Some tablet PCs feature a pen tether, a place where you can attach the stylus to the tablet by using a nylon cord. The tether comes in handy for all those pen-droppers, who loathe the awkwardness of searching underneath an airline seat for anything. The Microsoft Surface Pen is a Bluetooth wireless peripheral. It connects automatically to the Surface tablet. Other styluses may require additional setup, such as Bluetooth pairing or another type of interface. Some simpler styluses may work by simply interacting with the laptop’s touchscreen. If the tablet PC came with a stylus, it most likely sports a pen port or some kind of stylus garage. Use that hold to keep the pen when you’re not using it. To remove the pen, push it in a tad. The pen pops out so that you can grab it. Insert the pen all the way until it clicks. If your tablet PC lacks stylus stowage, keep the pen in your laptop bag or anywhere it can stay with the laptop and not get lost. Replacement pens are available, but they’re not cheap. The Microsoft Surface pen is designed to clip onto the removable keyboard/cover. Yes, that’s another thing you need to buy, but you probably have one already. Most of the time, you use a digital pen with your tablet PC just as you’d use a mouse on a desktop computer. It makes an excellent pointing device, but it does have its quirks. Here are the pen and mouse equivalents. Click Tap Tap the stylus on the screen. Double-click Double-tap Tap the stylus twice on the same spot. Right-click Long-tap Tap and hold the stylus on the same spot. As you hover or point the mouse on the screen — without touching the screen — you see a pen pointer appear. That tiny target is called the pen cursor. It’s easier to navigate through menus when you hover the pen, as opposed to dragging the pen. The drag action doesn’t require the pen to touch the screen. For example, when perusing menus, you can use the hover technique. You can simulate a right-click by pressing the pen’s button and then tapping the screen. If the pen features two buttons, the right-click button is the top one. You can always use your finger to tap or drag items on the screen. It’s easier to use your finger to swipe through a document or move a window. Use the Control Panel’s Pen and Touch dialog box to customize the way the stylus interacts with Windows. In the Control Panel, choose the Hardware and Sound heading, and then choose Pen and Touch to see the Pen and Touch dialog box.